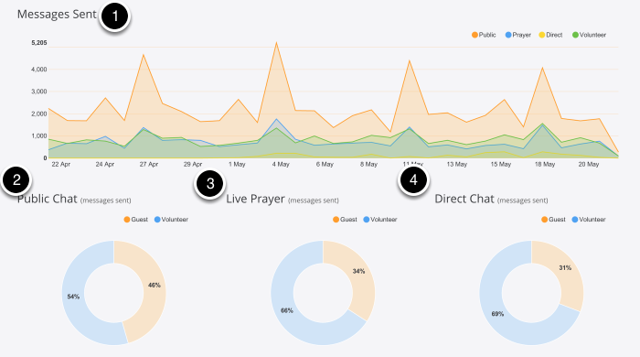 The Dashboard is a place to view key pieces of data about your Church Online account like, Attendance, New Users, and Messages sent. The Dashboard is the first screen that you see when logging into the Admin. This is the range for which the data is being displayed. Currently, this field is locked to last month. This is the number of unique visitors to your site during the date range above. This is tracked locally by our system. NOTE: This number may vary slightly from other "Attendance" metrics you may already be using (Google Analytics, your video provider, etc). There are numerous reasons why this may be the case. You can decide which number is most accurate for your church. "New Users" refers to the amount of people who signed up for a new account on a given day. "Top Inviters" refers to the users who shared links that were clicked. This area is used to show your most active attenders. "Messages Sent" refers to the number of messages sent on a given channel. There are 4 different channels that are tracked; "Public", "Prayer", "Direct", and "Volunteer"
Public Chat is the chat on the main page, this would include all the messages from volunteers and hosts. This chart shows your percentage of Volunteers to Guests conversations. Live Prayer is the chat that is exchanged between Guests and Volunteers. This chart shows your percentage of Volunteers to Guests conversations. Direct Chat is the chat room that is initiated by the volunteer team and is done 1 on 1. This chart shows your percentage of Volunteers to Guests conversations.